What better way to determine the expertise and quality of a web designer than to examine actual projects they have produced. We enjoy working with small to medium sized business, especially start-ups, and continue to expand our repertoire and diversity of the different kinds of businesses we have worked with. Below is a representative sampling of our work. 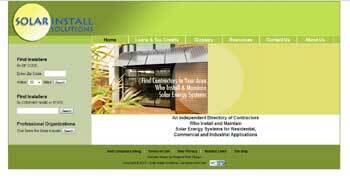 Click on any of the homepage snapshots below to visit and explore each website. 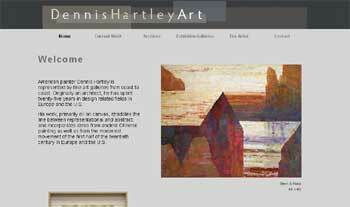 American painter Dennis Hartley is represented by fine art galleries from coast to coast. Originally an architect, he has spent twenty-five years in design related fields in Europe and the U.S. His work, primarily oil on canvas, straddles the line between representational and abstract. Ivy Cotler, at Ivy's Cookin', provides home-cooked entrees, delivered to your door, the culinary boutique - a healthy selection of jams, desserts, dressings, and chutneys, gift certificates and seasonal veggie baskets. 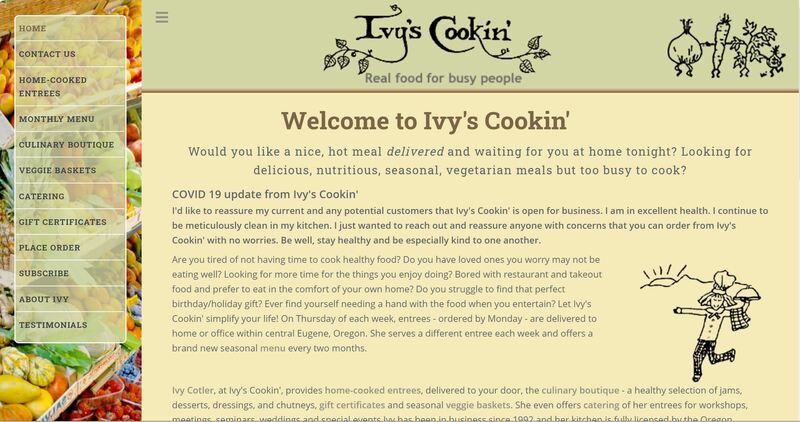 Ivy has been in business since 1992 and her kitchen is fully licensed by the Oregon Dept. of Agriculture. 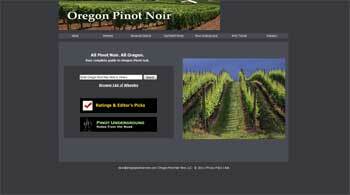 Oregon Pinot Noir Wine is a portal to your complete guide to Oregon Pinot noir wine information. Tango Art Prints is the exclusive site to acquire archival quality, limited edition reproductions of paintings by Dennis Hartley, which strive to capture the emotion and artistry of Argentine tango. A professional abstract landscape painter since 1998, his original artwork is represented by fine art galleries from coast to coast. Dennis discovered Argentine tango in 2006, and has been dancing regularly since then. In 2008, he began to combine his passion for tango with his art to create this unique body of work offered by Tango Art Prints. 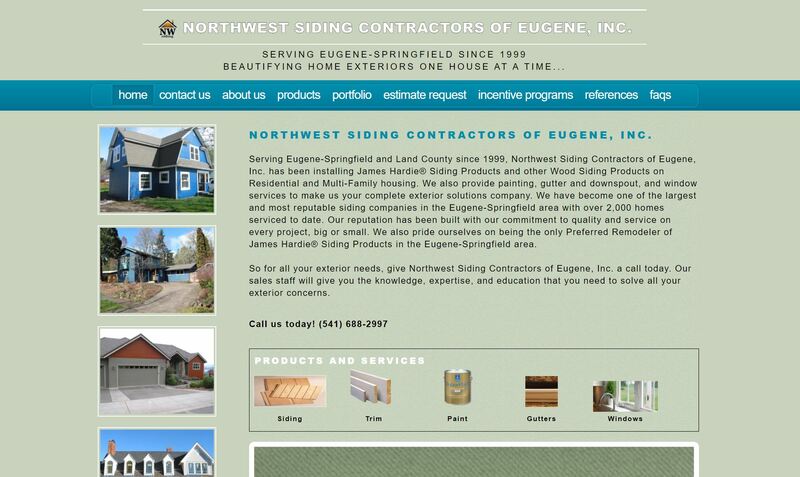 Since 1999, Northwest Siding Contractors of Eugene, Inc. has been installing James Hardie Siding and Wood siding products on residential and commercial buildings. We also provide high quality painting and gutter services to make us your complete exterior remodeler. We have become one of the largest and most reputable siding companies in the Eugene/Springfield area with over 2,000 houses sided to date. Our reputation has been built with our commitment to quality and service on every project, big or small. We also pride ourselves on being the only preferred remodeler of James Hardie Siding products in the Eugene/Springfield area. Photo Stock Source specializes in digital stock photos of travel, nature and people. They provide both Royalty Free and Rights Protected Licenses as well as color prints in all sizes including banners from panoramas and outstanding and personal customer service. 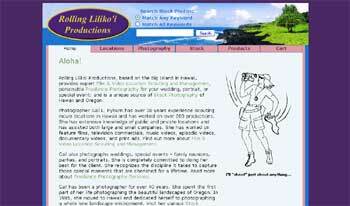 Rolling Lilikoi Productions, based on the Big Island in Hawaii, provides expert Film & Video Location Scouting and Management, personable Freelance Photography for your wedding, portrait, or special event; and is a unique source of Stock Photography of Hawaii and Oregon. 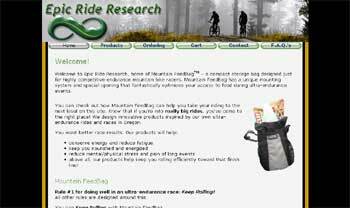 Epic Ride Research is home of Mountain FeedBagTM - a compact storage bag designed just for highly competitive endurance mountain bike racers. Mountain Feedbag has a unique mounting system and special opening that fantastically optimizes your access to food during ultra-endurance events. Ram Jack of Oregon is the preferred provider of a unique, low-impact, piering solution for foundation support and repair. 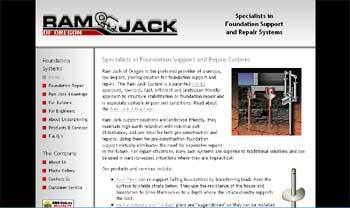 The Ram Jack System is a patented ICC-ES approved, low-cost, fast, efficient and landscape-friendly approach to structure stabilization or foundation repair and is especially suitable in poor soil. We are a glass center with a twist - an open studio where you can create your own glass art any time we're open - even with no experience. 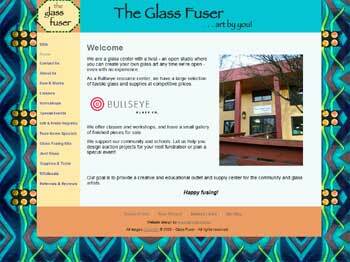 As a Bullseye resource center, we have a large selection of fusible glass and supplies at competitive prices. We offer classes and workshops, and have a small gallery of finished pieces for sale. We support our community and schools. Let us help you design auction projects for your next fundraiser or plan a special event! Panorama Source specializes in digital stock panoramic photos from all over the world. They handle wide angle headers for websites, banner illustrations for blogs, or Royalty Free or Rights Protected digital licenses for advertisements. They also produce wide format color panoramic prints. 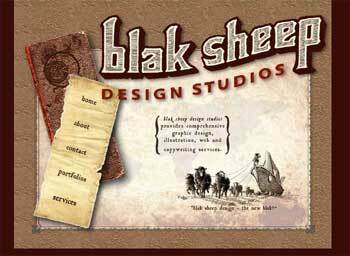 Blak Sheep Design Studios provides comprehensive graphic design, illustration, web and copywriting services. 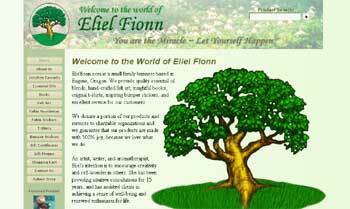 Elielfionn.com is a small family business based in Eugene, Oregon. They provide quality essential oil blends, hand-crafted felt art, insightful books, original t-shirts, inspiring bumper stickers, and excellent service for their customers.